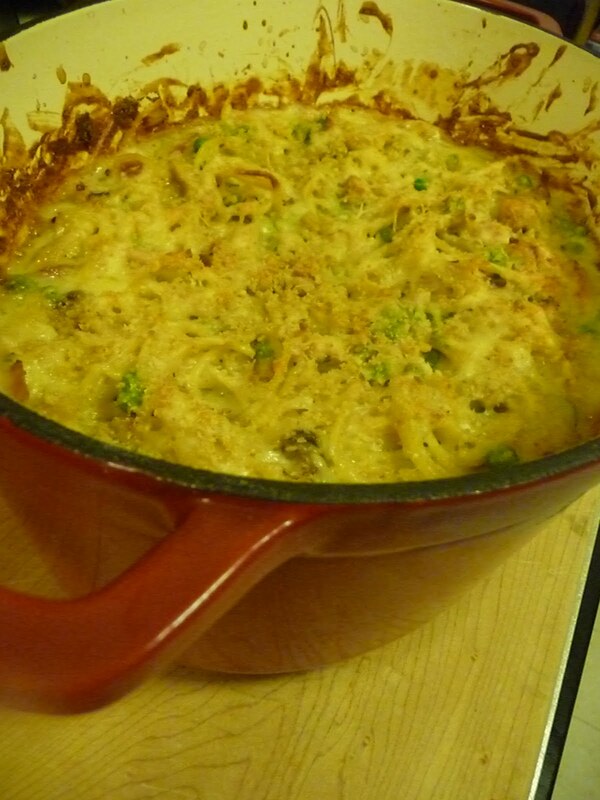 Tetrazzini is an American dish usually involving a non-red meat (often diced fowl or seafood), mushrooms, and almonds in a butter/cream and parmesan sauce flavored with wine or sherry and stock vegetables such as onions, celery, and carrots. It is often served hot over spaghetti or some similarly thin pasta, garnished with lemon or parsley, and topped with additional almonds and/or Parmesan cheese. There is no universal standard for the dish, so various parts are missing or substituted in various recipes. For example, another kind of nut, or different hard cheese. The name is often expanded to describe the specific protein used (e.g. Chicken Tetrazzini, or Tuna Tetrazzini). It’s Monday, alright? I’m tired. I made a huge dinner yesterday and worked all day at my crappy job. No, it’s not crappy I guess, sometimes I get SO TIRED of it though. I dream of winning the lottery, only so I could walk in and scream BITE ME I QUIT! Anyway. Sorry I didn’t take a whole mess of photos. I just wasn’t feeling it today. Too wiped out. I did take this one so you could see the funny mushrooms I used. They actually sell these at Raley’s. And now a word from our sponsors, BROCCOLI! This is my favorite way to eat broccoli. 1. Cut broccoli into florets and 1-inch chunks of stem. 2. 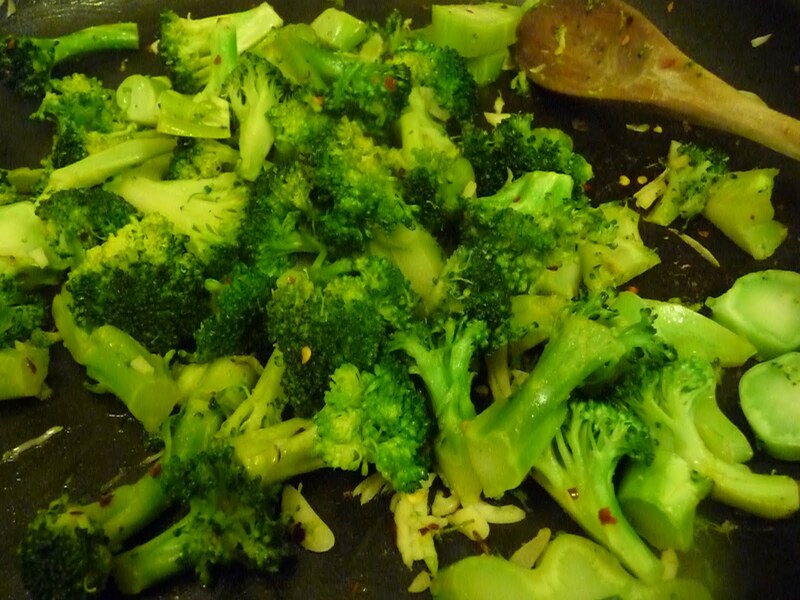 Put vegetables into a large saute pan. 3. Add water so that it covers the bottom of the pan. Not too deep. Maybe 1/2 inch. 4. Boil. Keep it boiling until the water evaporates. Keep an eye on it so you don’t burn the pan. 5. When water is gone, drizzle on 1-2 Tbsp olive oil, 3 thinly sliced cloves of garlic, salt to taste and a big pinch of chili flakes. 6. Saute just until the garlic is cooked. Broccoli should be cooked through but still have a bit of a bite. 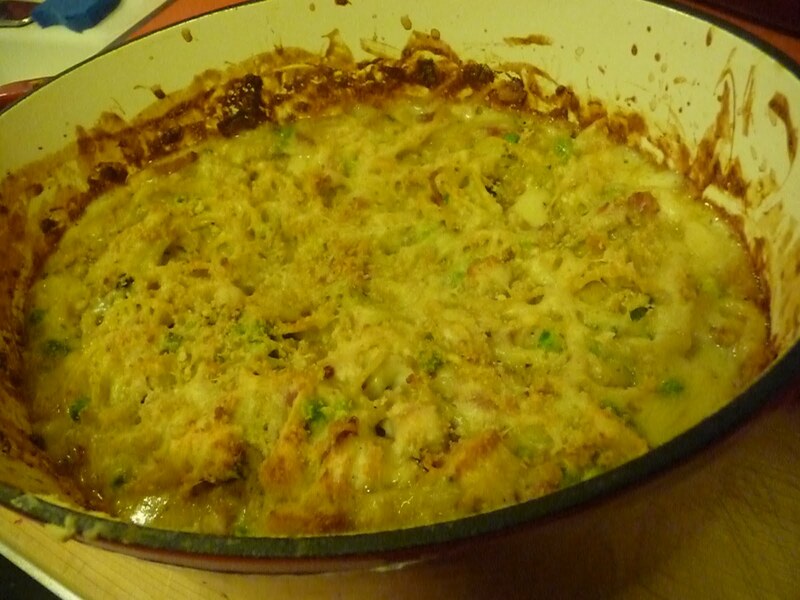 This was creamy, savoy and comforting. I advise you to make this if you have lots of leftover turkey. The crunchy bits on top were pretty irresistible. Cook pasta in a pot of salted water until a little less than al dente. It will cook longer in the oven so you want it slightly underdone. If you put the water on to boil at the same time you start the other things, the noodles should be done exactly the right time to go into the casserole! In a saute pan, cook the bacon pieces until crisp. Drain on paper towels and set aside. Pour off all but 1 Tbsp bacon fat. 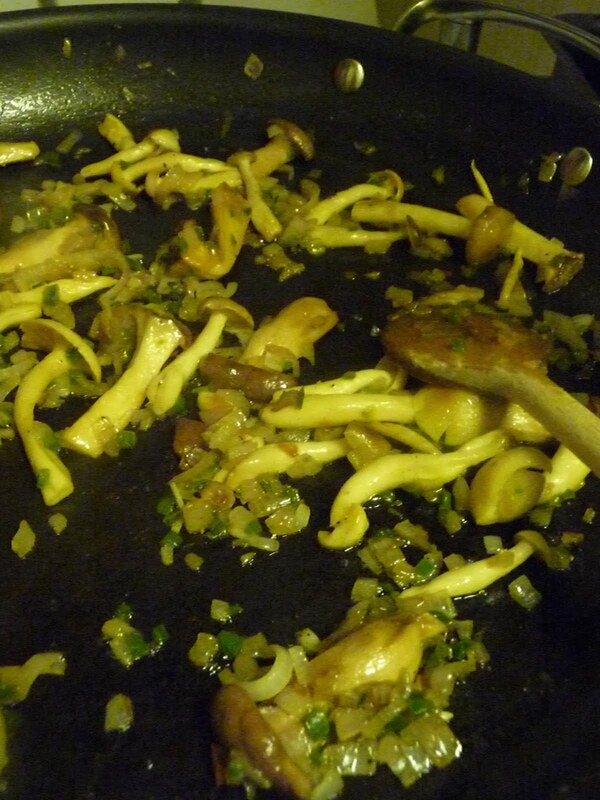 Add shallot and jalapeno and saute until soft. 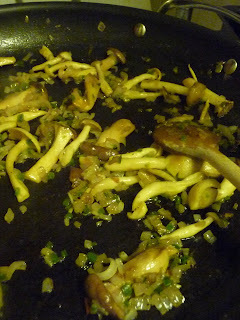 Add mushrooms and cook until they’ve released their liquid. Set aside. In enameled cast iron pan or other large oven proof dish, melt the 1/3 cup butter. Add the flour and cook, stirring frequently for 2 to 3 minutes. Add the stock, milk and cream, wine, nutmeg, paprika and cayenne. Bring to a simmer and cook, stirring constantly for 5 minutes. Sauce will thicken. Add spaghetti, turkey, 1-1/2 cups of the Swiss cheese, 1/4 cup of the Parmesan cheese, peas, mushrooms, bacon, green onions and parsley. Season with salt and pepper to taste. In a small bowl, mix the remaining cheeses with the bread crumbs and 1 Tbsp softened butter. Using your finders, mix together and sprinkle on top of the Tetrazzinni..Bake for 30 minutes. Baby Back Ribs with Peach-Bourbon BBQ Sauce! Next post: School Project: A Wine Pairing Dinner featuring Leek Bread Pudding.